Helambu is quite popular among the trekkers due to its amazing scenery and good climate. It is located about 72 kilometers northeast of Kathmandu, it extends from north of Taramarang to the tree limit of the Gosainkunda Lake and lower slopes of Jugal Himal. There we meet several highland Tamang and Sherpa villages in the both sides of Malemchi Khola. In Helambu trek, you can observe beautiful pine forest, slow moving rivers and swift mountain streams, rugged rock and snow-capped peaks, grassy downs and meadows strewn with daisies and wild primulas. In the upper part of the valley, there are snow bridges spanning angry torrents, high passes enveloped in mist, tiny lakes with icebergs floating on them and waters of crystalline brightness. Helambu trek is comparatively easier due to the fact that the elevations are lower, ranging between 800m. and 3600m. It offers less climbing as well as warmer temperatures. The most important benefit of this trek is that the area is less crowded & free from noise in comparison to the Annapurna trek and some parts of the Everest treks. Besides this, the trek offers a wide range of cultures and spectacular scenes. 02. One Sherpa,(guide assistance) group size more than 4 pax. 03 Local Transportations Kathmandu – Sundhari Jal private vehicles drop. 05. English Speaking experienced Sherpa, Govt. Trained/Licensed Holder guide. 06. Porters ( One porter for 2 persons basis, Max 30 KGS per porter). 07. Shivapuri National park fee. 08. 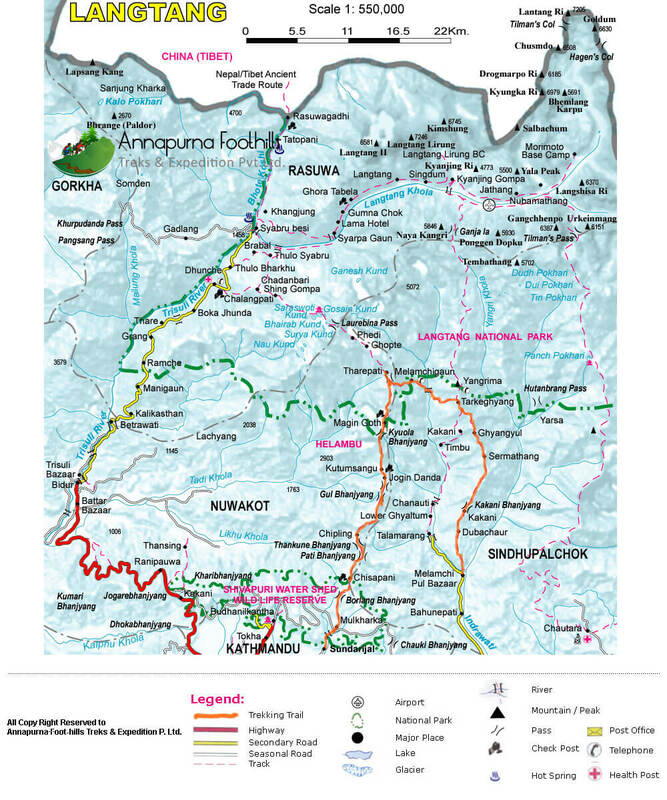 Langtang National Park fee, TIMS permits & Any required permits or Official Documentation. 09. Personal insurance for Nepalese staffs. 10. Welcome dinner with Live Nepalese Cultural Program. 11. Meal cost 22-26 US Dollars per head each day for the whole trek. And the meal consists of Breakfast, Lunch, Dinner, Tea or Coffee. 13. Guided sightseeing around Kathmandu Valley with all applicable entrance fees as per our itinerary. 14. Private Transportation, by Air-Conditioned Car Van, haice and Coaster for Sight seeing in Kathmandu as per our itinerary. 15. Dessert: Fresh fruits seasonal, Orange, Apple, Banana and Tin fruits. 16. Energy-supply chocolates: Snicker, Mars, Twix and Boundary. Boudhanath is a huge Buddhist stupa located about 7 km east of Thamel. It stands on a massive mandala style platform and has features similar to the Swayambhunath, though it is bigger than Swayambhunath in size. It is said that this stupa was built during the 5th Century. Every year, Thousands of pilgrims from Nepal and neighboring countries visit Boudhanath, particularly in winter and Pashupatinath temple. Pashupatinath temple is one of the biggest Hindu temples. (Culture program) Over night stay at Hotel. Trail goes down hill till Pati Bhanjang . after here you have to ascends all the way to Chipling by crossing meadows and fields. There are good mountain views along this stretch of trail. Continuing along the forested ridge, the trail descends to a large Chorten over looking the Tamang village of Gul Bhanjang. From Gul Bhanjyang, the first part of the trail climbs up a steep, eroded trail through rhododendron forest passing only a few shepherd’s huts to a pass at 2580 meter. The treks proceeds north up the Yurin Danda ridge and affords views of Langtang and Gosaikund Peaks. We will cross the pass at 3510 meter before we descent to Magen Goth where we stop for lunch. Afterwards, we pick up the ascending/descending trail again, passing through forests, across flower-strewn meadows and crossing streams till we reach Tharepati (3640m). Walking down hill in a forest , vegetation changes to scrub bamboo as the route joins a rocky cattle trail towards to stream and traverse to a Chorten and a pasture, the first village since Tharepati. After crossing suspension bridge in Chhyadi Khola climb to reach the prosperous sherpa village of Melamchigaon . It is a large village with extensive fields of barley, corn and potatoes. largest village in the Helambu region. The stone houses are built closely together with narrow alley ways separating them. The gompa of this village has a large brass prayer wheel. The Kakani, which is the last Sherpa village on the trek, and we now enter the lowlands inhabited by Brahmans and Chhetris. 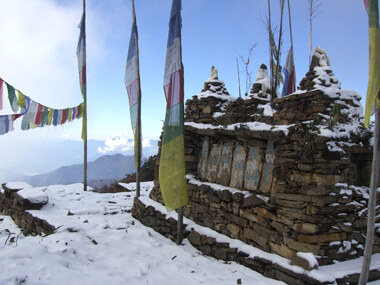 From Kakani, the trail drops steeply to the attractive village of Dubhachaur in a saddle at 1610 meter. Continuing further down the ridge, our trail will eventually bring us to a large suspension bridge which crosses the Indrawati river and brings us into Malemchi Pul Bazaar. From here, we will take private vehicles back to Kathmandu . We stay overnight at hotel in Kathmandu. After breakfast, our city guide reaches in Hotel with Vehicles, then we drive to Bhaktapur Durbar Square. Bhaktapur is one of the oldest cities in Kathmandu valley. It is well known as Living Museum. Old brick paved enclave of old Royal palace, Nyathapola Temple, Datatriya temple, exquisite artwork offers a picture of the grandeur of medieval Nepal. And Patan is located 7 km away from Kathmandu, this city has many 15th to 17th century, Hindu and Buddhist, monuments built during the Malla dynasty. The most important area with many monuments is the Patan Durbar Square. (Culture program) Over night stay at Hotel.